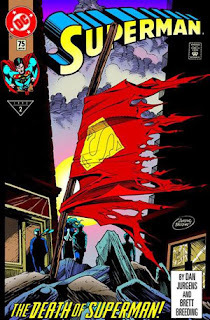 As a controversial comic starring a beloved hero is currently hitting the shelves in the form of Spider-man’s One More Day/Brand New Day arc, perhaps it’s time we looked over another similarly viewed series in the shape of The Death of Superman. At a time when the DC Universe was suffering on both the creative and financial front, the Death storyline came about far more by accident than grand design. As one of the more established and reliable comics very little major changes were inflicted upon the Man Of Steel over the years since his inception,. The surrounding universe was suffering plenty of debilitating alterations, though, many of which would be viewed in a less than positive light for years to come. Amongst them were one of the least inspiring JLA lineups including Guy Gardner, Fire, Ice and Booster Gold, not to mention one of many Lex Luthor clones and a hybrid Supergirl long retconned. The one defining factor of this era was the headline-grabbing demise of Kal-El, which came about in part thanks to Warner’s popular TV incarnation Lois and Clark: The New Adventures of Superman. Due to the fast moving and often fickle nature of television both the wedding and realisation of Lois that Clark and Superman were one and the same came together rapidly, coinciding with the same proposed revelation in the comic. The results of a possible clash could have easily spelt disaster for one property or the other, meaning one had to give way. In this instance, the TV won out. What major event could draw in the audiences without treading on the toes of Warner’s precious TV series? 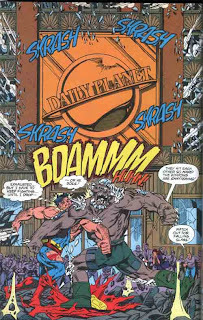 The decision to kill off Big Blue was made by the DC luminaries of the time in Dan Jurgens, Mike Carlin and then writer of the book Roger Stern. 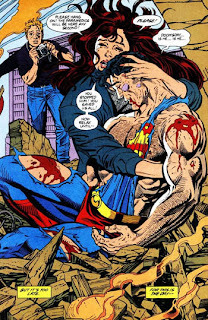 Stern had taken over from John Byrne, who had greatly reduced Superman’s power levels in his tenure to make the possibility of severe injury all the more possible. Byrne left under something of a cloud, citing various reasons for his departure, but the long-lasting effects couldn’t neither be easily erased nor removed, making a far more drastic approach necessary. In the words of Carlin himself "the world was taking Superman for granted, so we literally said 'let's show what the world would be like without Superman'." From a marketing point of view the ploy was perfect, bringing back lost readers to see the impact on a world without Superman and, more importantly, who or what managed to put him in the ground. The task landed at the feet of alien behemoth Doomsday, a hitherto unknown character who simply began going on a brutal rampage. Interspersed with a tale that involved the Underworlders - who were an experiment of the Cadmus project - the green-clothed destroyer cut a path through the countryside graphically doing away with a number of animals and humans. First on the scene to stop the creature isn’t Superman himself, who was appearing on a daytime chat show, but the aforementioned Justice League. The over confident Guy Gardner gets dealt with first, being firmly planted underfoot and rendered virtually useless for the rest of the battle. The likes of Booster Gold, the always unfortunate Blue Beetle, and Bloodwynd are tossed asunder, until Superman turns up to engage in a window-shattering throwdown. Two elements are starkly apparent that allow this story to be elevated above a callous event or out-of-character series of incidents. The first is the absence of Kryptonite. At no point is a ring, arrow or corkscrew produced to weaken Superman prior to his death. This makes the story something of a watermark as most stories use the green meteor rock to weaken Supes for a beating at the hands of his rival, dropping the Man Of Steel to more vulnerable power levels. Not so in Death. Instead he is simply pushed to his limits by raw power and brutishness, making the unexplained appearance of Doomsday all the more chilling. The second is the true weakness of Superman: the human race. On numerous occasions normal people try to get involved, or simply get in the way, and Superman usually loses the upper hand in the fight as a result. His ultimate downfall is trying to protect Lois, and his overwhelming moral responsibility. Having such a - dare I say it - human character flaw as a more harmful weakness than Kryptonite made the conclusion all the more jarring. The post-Death storylines offered plenty of intriguing events and enough characters to stand the DC Universe in good stead, but the impact of the story was felt around the world. Network news channels carried the story and, in the days before the internet became anywhere near widespread, word of mouth made the story one of the most popular in history and brought back numerous lapsed fans as well as introducing a generation of new ones. For a story designed to fill a gap while a more popular media grabbed the spotlight Death did the reverse, grabbing plenty of headlines and giving the comics arm of DC a well-needed push in the right direction. I loved The Death of Superman storyline; even more so now when you hold it up against what's been going on in the Marvel Universe. This is a brilliant example of how to manage a contrived controversy and boost readership... not drive readers away with seemingly random acts of continuity destruction. The recent animated Superman DVD does a good job of reimagining this storyline and there are some interesting documentaries on there as well telling the background to story from the writers', artists' and editors' point-of-view. There's a nice box set available of the trade paperback collection of the individual issues, packaged with a couple of cool action figures - Superman and Doomsday. I was still a total Marvel nerd and hadn't really ventured into the DC Universe beyond a few Bat-books when it came out, but I do remember the news reports and found myself being almost.... tempted. I finally got around to reading it several years later - it's certainly an enjoyable read but it did make me wish I'd picked it up at the time without any knowledge of what was to follow. Great article though, I may have to dig it out again myself. I never read it when it came out. Same applies to Batman getting his back broken by Bane. I knew neither storyline would be permanent so I didn't see the point. I'm a firm believer that Marvel and DC shouldn't introduce an 'earth shattering' storyline unless they intend to stick with it permanently. Over the last 25 years Marvel and DC continuity has become ludicrous thanks to storylines such as this one where characters continually die only to be reborn through the flimsiest of plot lines. No wonder non-comic readers think our favoured medium is childish and nonsensical. I think it's difficult to apply permanence to a lot of the Marvel & DC characters due to the fact that they are essentially ageless - their surroundings may adapt to contemporary settings but they themselves remain more or less the same. And, based on your comment Rob, it seems you decided never to read the Death Of Superman on the basis that it wouldn't stick, rather than whether the content was any good? In that case, shouldn't you jettison Captain America from your reading list as it's inevitable that Steve Rogers will eventually return? I akways think that the immediate impact of a storyline is more important as, due to the long term nature of the popular titles, you almost have to accept the fact that elements will be ignored. I'm always more interested in the next six or ten issues rather than the next 50 or 100, as I think the constant changing of writers renders any permenant impact null and void. A fair comment, Matt. The difference between Cap and the other 'Death' storylines is that I was already reading and enjoying the regular Cap series before he was assassinated. In the case of Superman and Batman, I wasn't buying the regular titles at all. So what I'm saying there is I didn't go out of my way to pick up the issues where Supes died and Batman ended up in a wheel chair, just because they were 'big events'. I'm not advocating dropping a title that you're already reading and enjoying, unless of course the quality of writing/art deteriorates markedly. That hasn't happened with Cap. In fact I've been enjoying the last year's worth of issues without him in it even more than when he was in it! I always think that the true success of such an event is how it's viewed afterwards. If something is poorly written, out of character or happens for the wrong reasons the comic won't last the course. I think Death and Return is still viewed in a positive manner because it still reads well, and has both a decent flow and general tone unlike, for example, Spider-man's clone saga which got a little convaluted and too confusing.